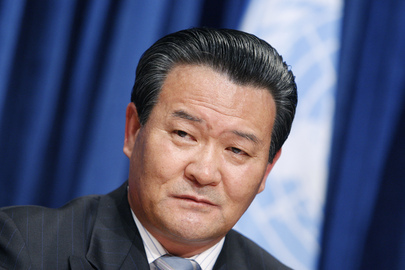 UNITED NATIONS, June 16 -- A day after the raucous UN press conference of North Korean Ambassador Sin Son Ho, denying his country sank the Cheonan ship, a South Korean diplomat asked Inner City Press what reporters thought, and in essence, who was winning the "propaganda" war. Sin Son Ho threatened military reaction to any statement by the Security Council, refused to comment on his country's chances in the World Cup, said that if the Council passed anything, "I will be fired." It was the talk of the press corps, even the next day. One wag analogized North Korea to O.J. Simpson and his defense to murder charges. The Simpson defense team raised questions about the investigating police, about the evidence, about the decedent. When Inner City Press made this analogy to the South Korean diplomat, he shook his head. They must show an alibi, he said. They must show physical evidence. But must they? Just as the Simpson team unearthed racially charged statements by investigating police, there is the matter of the "Drunken General" Lee Sang Eui, who was on duty at the time of the sinking, and was fired just before South Korea's Council presentation. The South Korean diplomat acknowledged the Drunken General issue, but said it had nothing to do with proving how the Cheonan sank, it was only a "chain of command" issue. When Inner City Press asked Sin Son Ho about the Drunken General, his spokesman smiled, and he declined to answer. He also wouldn't answer about the UN Development Program re-opening its program in, and web site about, the DPRK. But even with non-answers, UN correspondents were still buzzing that next day. "Better than Ban," one said, while others laughed. One problem is that South Korea's case was largely confined to a closed door "informal dialogue" of Security Council members -- and some non Council member countries, the diplomat pointed out. But no press. Meanwhile, Sin Son Ho held forth for nearly an hour, on the record. "It's like North and South Korea are playing different sports," Inner City Press said. No, no, the South Korean diplomat countered. We are playing football, only the feet are to be used. But North Korea is using their hands and their mouth. It is like at the World Cup, where North Korea brings beautiful ladies to cheer then on for television. People are impressed. But it is propaganda. Inner City Press asked if South Korea thinks it could have been a mistake by a lower or middle level North Korean commander. No, was the response. We have intelligence, it came from the top. What was that again, about showing evidence? Do your own press conference, Inner City Press suggested. No, the South Korean diplomat said. If they came forward with evidence, we would then rebut. But they have no evidence. But that's not the game they are playing. The South Korean diplomat, as China's Permanent Representative Li Baodong passed by, closed with a flourish. China and Russia both know our evidence is good, the South Korean diplomat said. Noth Korea wants to blow up the armistice agreement, they want a peace agreement with us and the US. But we have to deal with the nuclear issue first, not after. Good luck. Watch this site. UNITED NATIONS, June 14, updated -- Nearly immediately after the release of the South Korea led investigative report blaming the sinking of its Cheonan ship on its neighbor North Korea, UN Secretary General Ban Ki-moon said that the report was troubling, that the Security Council should take it up and take appropriate action. Since Ban so often uses the Security Council as an excuse not to comment on or take any role in important topics of the day, Inner City Press asked why this case was so different. Ban's spokesman hastened to say that Ban wasn't telling the Security Council what action to take, only to take it up. Inner City Press was told that one precedent for this was the Council's consideration of the killing of tens of thousands of civilians in Sri Lanka in 2009. Then, the Council held closed meetings in the basement while the matter stayed off the Council's agenda due to veto threats from Russia and China. Subsequently, the International Crisis Group has called for an international investigation of the UN's ineffective call for a ceasefire in Sri Lanka. "General Lee Sang Eui, chairman of the Joint Chiefs of Staff, may have falsified a document to make it appear that he was in the Defense Ministry’s command-and-control center on the night of March 26 when the Cheonan was sunk.. sleeping off a drinking session in his office." At the UN there was not mention of this. Ban Ki-moon was at the World Cup, where on June 12 South Korea played. On June 14, just before South Korea's presentation, Lee Sang Eui was fired. Watch this site. Update of 3:11 p.m. -- UN Security has pushed the press back from the second floor room where the Council meets about the Cheonan. To the side of the jam packed Vienna Cafe, a small crowd roars as Paraguay scores, going up 1-0 over Italy. The TVs are provided by the South African mission. There is no cheering among the press corps. No filming, no questions, no access. Update of 3:51 p.m. -- an Anatolian diplomat, emerging from the South Korean briefing, tells the assembled Asian press that he "personally" found Seoul's briefing convincing. The crowd follows him down the cement stairs. It is impossible to ask about the drunken general. Update of 5:19 p.m. - with media scrum chasing North Korean Deputy around, action moved to Twitter. But to recap: Araud of France says to his government, the evidence is undeniable: North Korea did it. Strong Council action merited, he says, but up to South Koreans (who are scared).